I bought a big ol’ bag of yukon gold potatoes at Sam’s and was needing to use some and I wanted something really flavorful so I made these! They are based off of this recipe that I found on Pinterest. For those of you curious how this fits into my hard-core Daniel Fast… I don’t really pay attention to salad dressings or sauces… meaning, I eat salads with dressing on them and foods with sauces… and well, I considered this a sauce. All I ate for dinner tonight was scalloped potatoes, and it was a great meal, and I totally felt like I was sticking by my agreement with God… I want you to know me more than I want burnt offerings. Hosea 6:6 And since it’s about knowing God… and not about my sauce, I feel like I’m in a good spot with Him! 1. Wash the potatoes and cut them into thin slices (you could probably do chunks of potatoes if you wanted… I chose scalloped because I wanted them to cook a little faster). No need to peel unless you want to do so. 2. In a separate bowl, combine the cream of celery, sour cream, parmesean cheese and ranch dressing mix. Stir until well mixed. 3. Put the potatoes into the crockpot and then add the soup mixture. 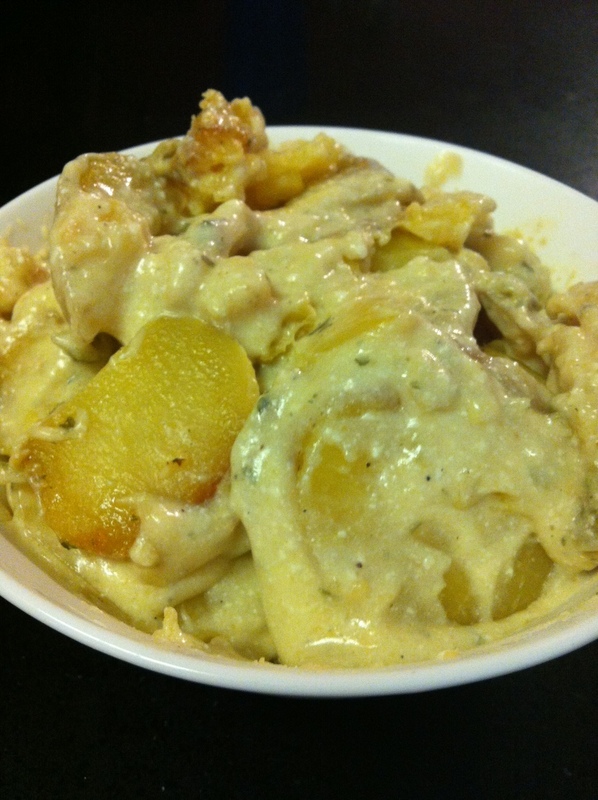 Gently stir the potatoes and mixture together until all potatoes are coated in the creamy goodness! 4. Cook on high for 3-4 hours or on low for 6-8 hours. But beware… it will smell heavenly and you might just be sure that they are done before they are… but alas, it will probably take them the whole time. 5. Dish into bowls if a main course (it was for me!) and let cool about 10 minutes before serving.